Along with Bertram and Hatteras, Viking is one of the most prestigious sportfish boat builders in the world. Bob and Bill Healey founded the company in 1964 by purchasing the Peterson-Viking Builders boatyard in New Jersey. They transformed the company into a leading semi-custom builder of convertibles. The first fiberglass design was a Viking 33-foot convertible in 1971. 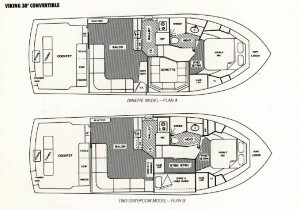 Their 40C design in 1972 provided the basic hull shape used for all yachts since. In 1987, Viking purchased the assets of Gulfstar Yachts in Saint Petersburg, Florida. Soon an economic recession and a misguided 10% luxury tax threatened to force the Healey brothers into bankruptcy. The Healey reinvested personal savings, cut back production, and smartly developed new tooling. It was during this era from 1989 to 1993 when Viking produced the 38-foot convertible that is the subject of this review. 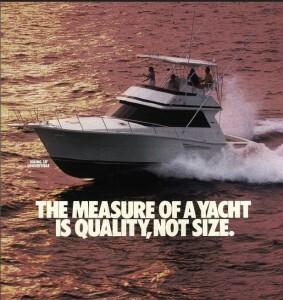 When the luxury tax was repealed in 1993, Viking quickly reestablished itself as a premier boat builder. Today, they have expanded to a service facility in Riviera Beach, a UK operation under the name Viking Sport Cruisers, and a Italian built 105-foot custom Versilcraft line. The Viking 38C has that classic convertible style with sweeping sheer lines, predatory windows, and ear tucked, grab your hat outriggers. Forward most is a molded bowsprit and stainless steel pulpit leading to a wide foredeck for sunbathing. Up top, the flybridge has a hard top and isinglass enclosure. The hull design of the in-house Viking team is a modified V with 15 degree deadrise at the transom. The 38-foot length understates the true LOA of 39′ 4″ from sprit to transom. The beam is distinctly wider forward than comparables at 14′ for a larger master stateroom. She tips the scales at least at 33,000 pounds. Clearance is 12′ while draft is just over 4′. Viking boasts takes pride in their layup schedule boasting how they sand for a best bond between each layer of glass. The topsides are cored. To stiffen the hull along with stringers, Viking glasses transverse beams at the bulkheads to create an egg crate like grid. All the the superstructure from the bow to the cockpit liner is tabbed together to create a one-piece leak proof base. The engines mount on structural beams which distribute loads and further stiffen the hull. Tankage is in molded fiberglass containers contoured to the hull. The 430 gallon fuel tank is under the cockpit, the 110 gallon water tank is forward the engine room, and a holding tank is along the keel below the forward cabin sole. Forward most, the molded bowsprit has an integrated windlass and deployment arrangement. The bow pulpit wraps around with predatory lines. On the wide foredeck are two hatches which provide ventilation and access to the master stateroom below. The superstructure on pilot models has front windows while others are solid fiberglass. The skinny side decks have handrails for maneuver around to the cockpit. The cockpit has about 3′ high combings with steps. Interior access is offset starboard side. There are two layouts. 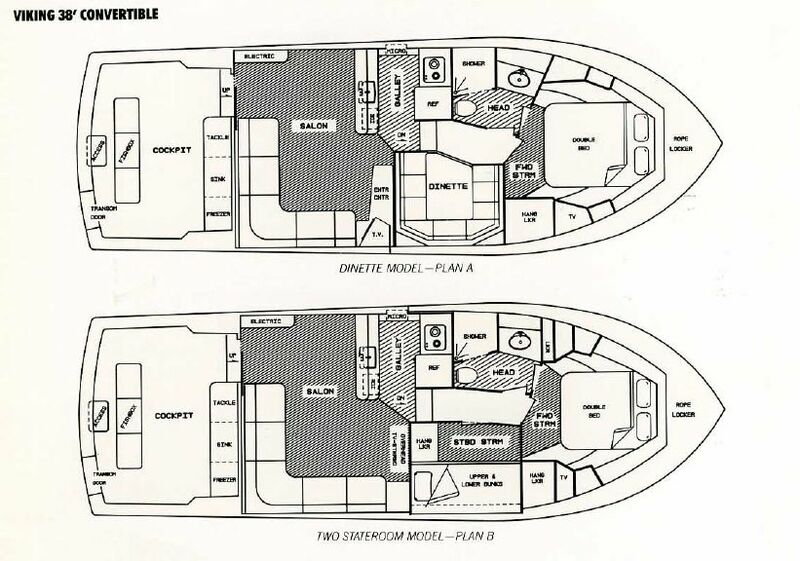 Plan A has a dinette arrangement that opens up the salon abreast of the galley. As a broker notes, this layout entertains 6, eats 4, and sleeps 2. Plan B swaps the dinette for a private guest stateroom with a bunk berth. This arrangement provides accommodations for sleep over guests or larger families. Interior woodwork is honey teak accented by white suede upholstery and cream headliner. Windows especially on the pilot versions naturally lite the interior. The master stateroom has an island queen and en suite head with stall shower. The head is accessible via the walk through or privately via the master stateroom. Access is via the companionway steps down to the galley and dinette/guest stateroom level. Crawl room is standard around the either 435HP 671 naturals, 450HP 671 TI’s, or 485HP 671 TIB’s by Detriot Diesel, J&T. Top access is available by pulling up the two salon floorboards. The Viking 38 luckily avoids the dreaded 93-series popcorn engines. A generator area is aft most starboard with likely an 8KW Onan. The engines mount on wide flanged beams like railroad tracks which secure to the bulkheads and stiffen the hull. Cruise speeds are okay at 22 to 23 knots with a max speed of 27 knots. She can be a bit wet according to one owner but handles chop well. The Viking 38C is a popular convertible yacht with nice accommodations. This design is excellent for cruising, exploring the east coast and Caribbean islands. Current prices range from $149k to $215k with nine for sale along the US Atlantic coast.